← What if We Didn’t Engage In Any Wars? The 2nd Amendment might appear ambiguous to some in spite of its brevity. It seems strange to me that our Founding Fathers would guarantee the right of everyone to bear arms. No nation before or since has ever made the right to bear arms a constitutional right for good reason. Uncontrolled firearm ownership could potentially threaten the State’s stability through revolution as did eventually occur 80 years later during the Civil War, our bloodiest war. They could also be a danger to the general public as was so painfully evident in the occasional mass shooting and other gun related crimes occurring many times daily throughout this nation. Thus all nations with apparently the single exception of the United States have control over the ownership and use of firearms. There are some nations that restrict firearm ownership to the military, law enforcement, and a few other special cases and others nations with far fewer restrictions. So what wisdom did our Founding Fathers have to include such an open-ended provision in the Bill of Rights? Conventional wisdom at that time and even today, in light of all the killings that have occurred and continue to occur due to firearms in our country, would suggest making firearms a controlled weapon, as all other nations do, due to its effective arbitrary lethality. Controlling is not the same as banning. Control means that the government can make laws governing its use, distribution and ownership. Making it a constitutional right makes it very difficult to control and restrict firearms as we have recently witnessed when congress voted against a very watered down gun control law for more extensive background checks as a result of recent mass gun killings. So why would our Founding Fathers intend the unrestricted ownership of firearms as a constitutional right? The wisdom of this for such a new nation does not seem at all clear. To the contrary, at that time in history other nations allowed firearm ownership by citizens, especially the wealthy, for hunting and sporting and in some cases even for dueling. But it was never a constitutional right. The option to further restrict the use of firearms was always available to these governments as illustrated by the eventual ban on dueling. When literally reading the 2nd Amendment it seems to imply that the purpose of the right of the people to bear arms “being necessary to the security of a free State” to protect the nation with “A well regulated Militia”. But the Supreme Court has elected to give it another meaning. So what else did our Founding Fathers intend the first half of the 2nd Amendment to mean if not what was literally written? I think that it is historically clear what “A well regulated Militia” meant to our Founding Father in the 18th Century. During the Revolutionary War it was necessary to form militias such as the Minute Men from the citizenry to fight the British. It would seem reasonable that the Founding Fathers would still like to have a well-regulated citizen Militia as a standby army since there was no standing army after the revolution and some did not want a powerful standing army such as the British had and used with great effect against them. So the necessity for a citizen Militia to defend the recently freed States against the British should they decide to take the colonies back would have been a very high priority for the newly formed government to grant and to guarantee the militia members “the right of the people to keep and bear Arms” for the purpose of protecting the State. Not that there was any mention of the right to acquire arms, only “to keep and bear Arms”. At that time every able-bodied male was considered a member of this militia thus the reference to “the right of the people“. Now things are starting to make more sense. A citizen militia existed to protect the newly formed States so the central government guaranteed the people the right to keep their arms to maintain a respectably large size militia. One other thing occurred just before and during the Revolution. The central government would regulate the militia (well regulated Militia) so that it could be called into active service should the need arise. This makes both logical sense and historical sense. As mentioned earlier there were many who were against a standing army which could control and limit the rights of the people as existed under British rule. So the 2nd Amendment seems more about a large standby citizen’s militia, due to the lack of a standing army to protect the states, than about the simple right of all people to bear arms for any purpose. Since we now have a professional standing army a militia is obsolete making the 2nd Amendment equally obsolete. This would imply that the public does not have the Right to bear arms for simply any reason. One thought for gun advocates: do they believe that the right to bear arms is an inalienable right of man and that all men everywhere in the world should have the same rights to bear arms, even potential terrorists, criminals, and murderers? This entry was posted in Constitution, Do No Harm, Government and tagged 2nd amendment, Amendment, bear arms, constitution, control, firearms, founding fathers, gun, gun control, intention, militia, right, right to keep & bear arms, United States, United States Constitution. Bookmark the permalink. 12 Responses to The Right to Bear Arms – Did Founding Fathers Intend it for All? Gun advocate POV in his article “Gun Control Nut Jobs…” who incidentally links to this article states a fairly good case for the the Supreme Court’s majority ruling in favor of the right of people to bear arms. The article justifies the ownership of military grade weapons such as AR15/AK47 with the exception of those guns listed under the “national firearms act of 1934 and the Gun Control Act of 1968”. But the issue really revolves around the intention and meaning by the authors of the preamble “A well regulated Militia being necessary to the security of a free state”. Do gun owners fall under the definition of “a well regulated Militia”? I claim that there no longer exist a Militia for the defense of the State or Nation that is “well regulated” by either State or Federal governments. What budget or agency regulates this Militia? Where in the government are the people who regulate this militia who’s purpose is to protect “the security of a free State” (not “To defend themselves… country!”)? Who is the official head of this regulatory agency? My contention is that the Militia has been replaced by a standing army and is now obsolete. If well regulated means a disciplined and trained group then do gun owners all consider themselves disciplined and trained as intended by the Founding Fathers? I doubt it. Militias no longer exists in the government. Thus if the militia no longer exists then the 2nd Amendment is no longer relevant and in fact is obsolete. We must go back to what was the rational of the Founding Father for putting in the 2n Amendment to start with. The most obvious answer was to have a Militia on standby to defend the new nation since there was no army. The Court’s claim “RIGHT TO POSSESS A FIREARM UNCONNECTED WITH SERVICE IN A MILITIA,” should require an amendment to the 2nd Amendment to remove “A well regulated Militia, being necessary to the security of a free State” since the Court say it is not relevant and it adds to the ambiguity of the Amendment. Yet it still remains so it must still serve a purpose. Read the Federalists papers . Read personal corrospondence of the founders . 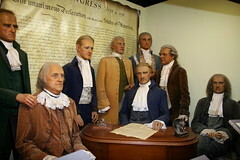 Read personal writings of the founders . Etc etc . Instead of people saying what they THINK the founders meant , it is much better to actually read what they said and really meant . “At that time the population was relatively small so all adult citizens with a firearm were expected to be part of the militia thus the reference to “right of the people”. A citizen Militia was to exist to protect each of the newly formed States and that the central government guaranteed the people the right to keep their arms to maintain respectably large size militias which would be well regulated by that government to control the militias and their use of arms. TRUE. The complete text is stated below. In the context of the times the militia consisted of all peaceable citizens with firearms (see previous discussion). At that time ‘the people’ and ‘militia’ were often used interchangeable with respect to firearms as in the 2nd Amendment. The argument gun advocates put forward for the Founding Fathers wanting the Right of all law abiding citizens to bear arms is that they wanted citizens to be able to overthrow an unjust government should things turn out that way as was the case with the English government with respect to the Colonies. The argument gun opponents put forward is exactly what is stated in the preamble to the 2nd Amendment. The framers were concerned that England might want to reclaim the Colonies and the new government did not have an army. So they were totally dependent upon a well regulated Militia to be quickly called into service should they be required. That required that the Militia always be armed. So if you haven’t taken sides yet then you be the judge of which argument sounds most reasonable and reflective of that time. No government before or since has granted the constitutional right of its citizens to bear arms for fear of the very reason given in the first argument. It is much easier to control access to guns without a constitutional right to them. Which ever argument you choose it is obsolete in today’s world. Because our armed forced is so well armed and technologically advanced, being the world’s best, makes the possibility of overthrowing our government by the people unrealistic. If the government put its full military might to squelch a rebellion it can do that quite quickly. As for a citizen’s Militia, our standing armed forces makes it obsolete. The 3rd Amendment also addresses a Militia Soldiers and is further proof of the significance of the Militia in the 2nd Amendment by the authors. It states: “No Soldier shall, in time of peace be quartered in any house, without the consent of the Owner, nor in time of war, but in a manner to be prescribed by law.” It prohibits, in peacetime or wartime, the quartering of soldiers in private homes without the owner’s consent. So it seems rather clear that there was good reason for placing the rights and the role of a Militia in the Bill of Rights.